My friends on Facebook are out of control posting political garbage. Many are memes that have been debunked. Who has the time to address every single post? One friend challenged his “liberal friends” to listen to Herman Cain’s radio program for a month. He said that the show aired from 9am – noon, Monday through Friday. Of course, being employed, I cannot listen to political talk radio during the day … unlike the friend of mine who made the challenge. He works less than 40 hours a week and his hours are inconsistent. His days apparently are spent listening to and reading right wing political crap and then spewing it all over Fecesbook. It’s not just my conservative friends that do this. My liberal friends are just as insistent on sharing their political opinions with people who really don’t want to hear it. I joined Facebook to keep up on the latest from my then high school aged children and to keep in contact with a few friends. We’d share family pictures and fun highlights from our day. Somewhere along the way, my friends went from sharing cute panda videos to memes telling us why President Obama is the worst president in our history. It takes less than five minutes to prove that most of these posts have already been debunked … but that is not why they post them. They don’t care if it isn’t real – they will believe it regardless to what the evidence proves. Facts? 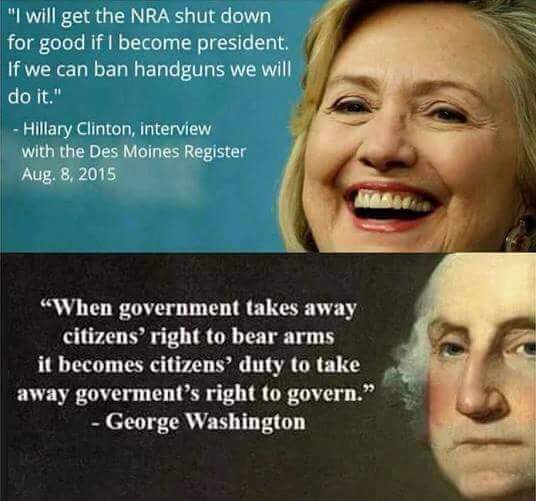 We don’t need no stinkin’ facts! Besides, facts are just liberal MSM propaganda. This meme is a little bit different. This is an attempt to deflect the attention away from the real issue. 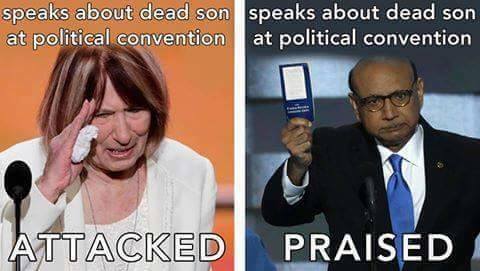 This meme wants us to think that after the mother, who lost her son in Benghazi, spoke at the RNC, the media attacked her, however, the father, who lost his son in Iraq, was praised by the media for taking on Donald Trump. How dare this mother blame Hillary Clinton for the death of her son? The real issue that this meme is trying to deflect our attention from was the reaction from a major party presidential candidate. Donald Trump retaliated against Gold Start parents. Mr. and Mrs. Khan’s son made the ultimate sacrifice. They lost their son while he was fighting to protect his country. Trump would have been wise to just stay quiet. But he has the inability to keep quiet. He took to the airwaves, rallies and social media to criticize the Khans. Members of Trump’s own party have denounced his comments. Over the weekend, Trump was interviewed by George Stephanopoulos on ABC’s This Week. Stephanopoulos: [Khizr Khan] said you have sacrificed nothing and no one … How would you answer that father? What sacrifice have you made for your country? Trump: I think I have made a lot of sacrifices. I’ve worked very, very hard. I’ve created thousands and thousands of jobs, tens of thousands of jobs, built great structures. I’ve done – I’ve had tremendous success. Trump: Oh, sure. I think they’re sacrifices. Trump equates success with sacrifice. Of course, Mr. Khan was referring to the ultimate sacrifice … giving your life for your country. Maybe Trump did sacrifice. After all, he now is the proud owner of a Purple Heart.